We are very pleased to announce that we have a plan for CMA 2014 in Acadia of the Lands and Forests. I am also very proud and excited of the fact that our little organization and the Association des familles Thériault de l’Amerique du nord (headquartered in Québec) are collaborating in our planning and conduct of our activities for the CMA. We look forward to spending time with the Association members to explore and learn about an important Acadian settlement; the Madawaska region. CONFERENCE: Both organizations along with our host organization, the Historical and Cultural Society of Baker Brook invite all of the Theriault’s of the Madawaska region to the church of ‘St Coeur de Marie’ at 9am on Saturday 16 August in Baker Brook, NB for a conference on the migration of the Theriaults to the Madawaska region from 1785 to 1875. I am very honored to be the speaker for the conference which will be bilingual. The discussion will go into the details of the specific lineages who migrated from Acadia directly to the Madawaska region and those who came after migrating to Québec for a few generations. We will talk specifically about the migrations to St-Basile in 1785, to St-Jacques in 1821 and to other settlements in the mid-1800’s. View of the St-John valley from the top of our mountain in Sainte Luce (Upper Frenchville, Maine) looking west toward Baker Brook, NB in the top left. The blue haze in upper left is the modern lumber mill in Baker Brook owned by J.D. Irving. The original mill at that location was the mill that Joseph Theriault, my great-grandfather built in 1907 after he moved from Moulin Morneault. When Joseph’s health failed in 1913, he asked his son, Joachim to take it over. Joachim sold it to the Couturier family in 1947. For the past 2-3 years, I have been involved in writing my second book which will be titled “Moulins du Madawaska” (Mills of Madawaska) and will share with the conference some of the details about the Theriault lineages that were involved in the milling industry. In fact, Baker Brook is the site of one of the early mills in the Madawaska region by Nathan Baker and his brother, John. And later, again in Baker Brook, there were several mills built by Don Fraser and in 1905, a mill by my great-grandfather Joseph which today is a very large industrial mill owned by J.D. Irving. Attendance will be free and will be open to the public. However, the members of the three sponsoring organizations will be seated prior to opening the conference to the public. The conference will adjourn around 11am before lunch. 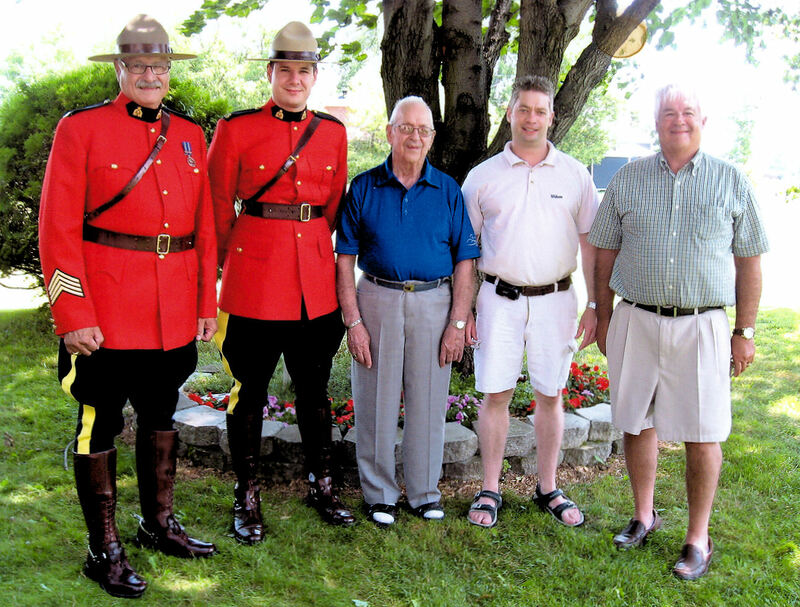 During the three days around the Theriault Reunion, the Terriot Acadian Family Society in collaboration with the Association des familles Theriault, will organize a tour of the four heritage sites that are important to the history of the Theriault family in the Madawaska region: St-Basile, NB; St-Jacques, NB; Sainte-Luce (Upper Frenchville, ME), and Baker Brook, NB. St-Basile (15 August, morning). We will spend about an hour outside at a venue where we will be able to appreciate the specular view of the St-John Valley as we talk about the first arrival of the Theriault’s in 1785 to St-David (across the St-John River) and St-Basile. The parish of St-Basile is the mother parish for all parishes in the St-John Valley. Therefore, the parish records include the vital records for a very large number of Theriaults. St-Basile was also the site of the very first hospital in the valley which was built by the Religieuses Hospitalières de St-Joseph, an order of Catholic sisters who are still there today. Some of the early administrators and directors of the hospitals were descendants of the Theriault family. Soeur St-Charles, whose mother was Pélagie Thériault was educated in nursing in Nashua, New Hampshire, Boston and St-Louis, Missouri and was the first radiologist in the region in the 1930’s. Plourde Office, present-day Moulin Morneault in the 1940’s.. The hamlet of Moulin-Morneault from the Chemin St-Joseph looking southwest. Joseph Thériault was raised by the Rousseau’s in the house (identified with a circle on the right) built by Pierre Plourde. Later, around the time that he married, he built his own house which is around the location of the house to the left (also identified with a circle). St-Jacques (17 August, morning). 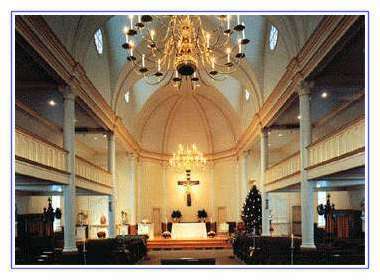 As an option, the tour group will be invited to join us for Mass at the parish church in St-Jacques which sits on the land that was claimed by Charles Theriault who was the first Acadian to settle in present-day St-Jacques in 1821 on the Madawaska River. After Mass, the tour group will move to a location on the land of Joseph Theriault in the small hamlet of St-Jacques called Moulin Morneault where the first mill in the area was built by Pierre Plourde, brother in law of Charles Theriault. We will talk about Joseph Theriault, his life in Moulin Morneault and his move to Baker Brook. Sainte-Luce (15 August, after St-Basile tour). My native parish, the parish of Sainte-Luce in present-day Upper Frenchville, Maine was a founded in 1863, about 20 years after the establishment of the international boundary between the United States and Canada in 1842 with the Webster-Ashburton Treaty. By this time, word had spread to the Theriaults who had migrated to Québec of the wealth in the natural resources and the availability of land in this rich valley. As a result, a third and fourth wave of migrations occurred moving from Québec to the Madawaska region. Here, some of the Theriault lineages settled in Sainte Luce, Fort Kent and others further east in Grand Isle and other parts. The church of Sainte-Luce is a most beautiful church inside and standing on the front steps as our tour group will, offers a most beautiful view of the St-John Valley as well. Baker Brook (16 August, noon). The powerful Baker Brook captured the attention of Nathan Baker in 1817 and later inspired Don Fraser and Joseph Theriault to each build their mills at that location. Today, Joseph Theriault’s water-driven mill has been expanded into the J.D. Irving lumber mill which produces some 16 million foot board measure of lumber and is a very large enterprise. The tour will gather in front of the Church of the St-Coeur de Marie where we will once again see a beautiful view of the valley and St-John River. The local historial society will have on display the iron turbine that was used to power the D. Fraser mill. If there is sufficient interest, we may be able to organize a tour of the Irving mill while we are there. Terriot Acadian Family Society Reception. 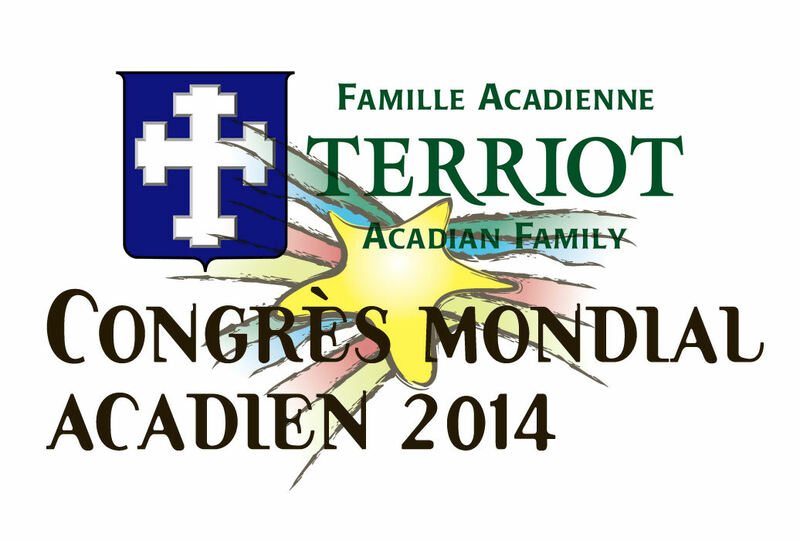 Finally, for our Terriot Acadian Family, we will organize a reception in St-Basile at a time during these 3 days (15, 16 or 17 August). The reception will be held at the old Hotel Diel, the old hospital. We will need to know how many Delegates will be joining us, so please let us know of your plans to attend. There will be a small presentation on our current status and progress of our genealogy and an open discussion among all Delegates on the future of our organization. It was always nice in the past CMA festivals to see each of your and to spend at least a few hours catching up with each other. This time, I hope you will give me the honor of welcoming you to my native land. Those of you who have not yet secured lodging, please let me know if you need help. I have some ‘connections’ which may be helpful. Some of the residents up there are opening up there homes as sort of ‘B&B’s at reasonable rates. Right now, all of the major motels are nearly fully booked. However, motels are still available in towns like Presque Isle, Maine which is about 45 minutes away from the CMA area.